© Chiong et al. ; Licensee Bentham Open. The SYNTAX score correlate with major cardiovascular events post-revascularization, although the histopathological basis is unclear. We aim to evaluate the association between syntax score and extracellular matrix histological characteristics of aortic punch tissue obtained during coronary artery bypass surgery (CABG). This analysis compares coronary artery bypass surgery patients with High and Low syntax score which were followed up for one year period. Patients with High (score ≥ 33, (n=77)) and Low Syntax Scores (score ≤ 22, (n=71)) undergoing elective CABG were recruited prospectively. Baseline clinical characteristics and surgical risks were well matched. At 1 year, EMACCE (Sum of cardiovascular death, stroke, congestive cardiac failure, and limb, gut and myocardial ischemia) was significantly elevated in the High syntax group (P=0.022). Mass spectrometry (MS)-based quantitative iTRAQ proteomic results validated on independent cohort by immunohistochemistry (IHC) revealed that the High syntax group had significantly upraised Collagen I (P<0.0001) and Elastin (P<0.0001) content in ascending aortic wall. Keywords: Collagen, Elastin, EMACCE, Extracellular matrix, Syntax. The SYNTAX score system is a widely accepted angiographic classification of coronary lesions, based on the anatomy and morphological changes in the coronary arteries. It was introduced in 2005 in the SYNTAX trial (The SYNergy between PCI with Taxus Drug Eluting Stent and cardiac surgery) and was used to stratify patients for CABG or percutaneous coronary intervention (PCI) [1, 2]. The relationship between high syntax score and increased risk of post-procedural cardiovascular events is well known . However, the histopathological basis behind this association remains unknown. The long-term result for patients with CAD is compromised by the progression of atherosclerosis in native coronary artery, vein bypass grafts, and other major arteries. Patients are, therefore, at high risk for second cardiovascular events after CABG, including death, myocardial infarction (MI) and stroke. The progress of atherosclerosis is multi-factorial and influenced by risk factors but risk factor models are still unable to identify the CABG patient at risk for a second cardiovascular event. Recently, atherosclerotic plaques have been shown to contain information about future cardiovascular events . Carotid plaque protein levels like FABP4 , MMP8  and MRP 8/14  have been associated with the risk of secondary cardiovascular events after carotid atherectomy. This revealed that atherosclerotic plaque protein levels and histology contain prognostic information on secondary cardiovascular events after carotid atherectomy. For CABG, it is unknown if aortic tissue contains information on the risk of future cardiovascular events. We hypothesize that aortic punch tissue (ascending aortic tissue) of patients with High and Low syntax score groups are histopathologically different, especially in relation to extracellular matrix content. Our study recruited 279 consequent patients, admitted for elective CABG with stable angina in the Department of Cardiac, Thoracic and Vascular Surgery, National University Health System, Singapore from 2009 till 2011. All patient information was collected prospectively. The Syntax scores were calculated by two experienced and independent medical staff, which were blind to procedural data and clinical outcomes. The lesions with more than 50% of stenosis in all major coronary vessels were scored and their syntax scores calculated, using the official website online calculator (www.syntaxscore.com). Patients with intermediate scores (23-32) were excluded from this study, leaving a total of 148 patients in the Low Syntax (Syntax ≤22, 71 patients), and High Syntax Score group (Syntax ≥33, 77 patients). Before their operations, the recruited patients underwent routine investigations, including lipid profiles, renal panels, full blood counts, electrocardiograms, echocardiograms and coronary artery angiograms. The Euroscore II was calculated for every patient. The baseline clinical characteristics of the High and Low Syntax Score groups did not reveal statistically significant differences in demographics, the major cardiovascular and surgical risks factors (Table 1). Follow-up data was collected over 1 year post-CABG, using hospital records of outpatient visits, repeat hospitalizations and regularly scheduled telephone interviews. We define Extended Major Cardiovascular and Cerebrovascular Events (EMACCE) as the sum of cardiovascular death, cerebrovascular events, myocardial infarction (MI), limb ischemia, gut ischemia, and congestive cardiac failure. Demographical and pre-operative data of Low and High Syntax Score Groups. The tissue collection, research design and protocol were approved by the institutional Ethical Review Board (NUHS DSRB registration no. : 2009/00216). The recruited patients underwent elective coronary artery bypass surgery for stable angina. We performed standard full normothermic cardiopulmonary bypass and cold (4°C) anterograde cardioplegia for all recruited patients. An aortic punch tissue was collected at the time of proximal anastomosis between the aorta and saphenous vein grafts. The tissues from the punch were then immediately collected using dry ice, preserved at -80°C and kept in liquid nitrogen tank (Tissue Bank registration: NUH/2009-0073). The 24 patients in Low Syntax score group and 21 patients in High Syntax score group underwent proteomic analysis. The frozen tissue stored in liquid nitrogen underwent LC-MS/MS-based iTRAQ quantitative proteomic analysis (full method description in Supplementary Material 1). Briefly, tissue samples pooled from each disease group had their proteins extracted, precipitated and digested. Tryptic peptides were extracted, dried and labeled with iTRAQ reagents. The iTRAQ labeled peptides in individual groups were pooled and then followed with Electrostatic Repulsion-Hydrophilic Interaction Chromatography (ERLIC) fractionation. 30 fractions were collected, dried and then reconstituted in 0.1% formic acid for LC-MS/MS analysis using a Q-Exactive™ Hybrid Quadrupole-Orbitrap Mass Spectrometer (Thermo Fisher Scientific Inc., United States). To achieve better coverage of the target proteome and statistical consistency, 3 technical replicates of the labeled peptides were injected and analyzed in a LC-MS/MS system. A full MS scan (350–1600 m/z range) was acquired at a resolution of 70,000 in the orbitrap when the maximum automatic gain control (AGC) target of 3 E6 or a maximum ion accumulation time of 100 ms was reached. The 10 most intense peptide ions with dynamic exclusion duration of 30s and charge states of 2 - 5 were sequentially fragmented and isolated to a maximum AGC target of 2 E5 or a maximum ion accumulation time of 120 ms. MS/MS scan was acquired at a resolution of 35,000 in the Orbitrap. Spectral data analysis was performed using a Thermo Scientific™ Proteome Discoverer™ (PD) 1.4 software, connected to SEQUEST®HT (Thermo Fisher Scientific Inc., United States) search engine. The spectra were searched against the Uniprot Human database for protein identification. Only peptides identified with strict spectral false discovery rate<1% (q-value≤.01) were considered. The search was constrained to a maximum of 2 missed trypsin cleavages; peptide precursor mass tolerances of 10 ppm; and 0.02 Da mass tolerance for HCD fragment ions. The iTRAQ8plex quantification method within PD 1.4 software was used for the calculation of reporter ratios with mass tolerance set at 10 ppm. The average ratio, percentage variability and only unique peptides were employed for protein quantitative changes in protein composition and expression. Aortic wall prevalent ECM proteins were selected as proteins of interest. Our analysis included Elastin (ELN), Collagen alpha-2 (I) chain (COL1A2) and Collagen alpha-1 (III) chain (COL3A1). These proteins were identified and quantified with high confidence (FDR ≤1%, ratio variability ≤10.7%, SD ≤±0.13). Stringent criteria to minimize false positive protein identification included: (1) protein identification with ≥2 peptides with 99% peptide confidence present in 3 technical replicates and (2) p-value ≤0.05 to ensure that protein identification and quantification are not based on single peptide hits. Mass spectrometry results were validated on independent cohorts. For IHC analysis of aortic wall tissues, tissue samples from 25 patients with Low Syntax score and 29 patients with High Syntax score were blocked with formalin and embedded in paraffin. Analysis was performed according to an established protocol described in our previous publication . We designed a tissue microarray (TMA) using small disks of tissues harvested from the paraffin-embedded histological specimens. Combining all specimens on a single array allowed us to triple-stain for Collagen I, Collagen III, and Elastin antigens in a uniform fashion. The sections were incubated with diluted primary antibodies: Collagen I (Abcam, Cambridge Science Park, United Kingdom, ab34710), Collagen III (Abcam ab6310) and Elastin (Abcam ab52115) overnight at 4°C, followed by incubation with diluted secondary antibodies. Fluorescence images were scanned sequentially and analyzed using Ariol software (Genetix) with total fluorescence score as describe in our previous publication. Fluorescence cross talk between fluorophores was tested and found to be negligible. Mass spectrometry results were presented as expression ratios of target proteins of interest that were extracted and p-values were determined by unpaired Student’s t-test. A p-value <0.05 was used to indicate statistical significance. The overall expression cutoff was set at 1.2-fold change relative to Low Syntax Score; ratio ≥1.20 was regarded as up-regulated expression and ratio ≤0.83 was regarded as down-regulated expression. Statistical analysis for IHC was performed using STATA (release 12.0; StataCorp, College Station, Texas) statistical software. Continuous variables were compared using the ANOVA test and also performed Bonferroni adjustment for multiple comparisons. Categorical variables were compared using either the chi-square test or Fisher’s exact test as appropriate. To compare the level of Collagen and Elastin between Low and High syntax score groups, the Generalized Linear Model (GLM) using Gaussian family, identity link function, and main effect model was exploited with robust standard error estimates with (cluster id) option for repeated biological samples assays within same subject . The proportion of composite EMACCE in High and Low syntax groups was compared by constructing survival curves using the Kaplan–Meier method and using the Cox test of equality . A two-sided p-value of less than 0.05 was considered to indicate statistical significance. Collected operative data showed significant differences between Low Syntax score and High Syntax score groups. The cardiopulmonary bypass time (Low Syntax: mean 132.52, SD 46.54, P=0.0064), aortic cross clamp time (Low Syntax: mean 75.73, SD 28.40, P=0.0006) and number of grafts used (High Syntax: median 4, P=0.001) were different. Cumulative results for cardiovascular complications were collected over 1 year. Overall, after 1 year post-CABG, the Higher Syntax score group had a significantly higher rate of EMACCE than the Low Syntax Score group (Low Syntax 2.67%, High Syntax 13.19%, p=0.022), as presented in (Fig. 1). The number of EMACCE in the High and Low syntax score groups were 12 and 2 respectively, and 4 out of the 12 EMACCE from the High syntax score group occurred in the early post-operative period (≤1 month). The individual components of extended MACCE were not significantly different between the two groups in isolation (Table 2). Overall, myocardial infarction (confirmed by one of the available test) was the most common event: 7 out of total 14 EMACCE were due to myocardial ischemia, and 6 myocardial events out of 7 were from the High syntax score group (7.79%, P=0.118). Among the 3 patients who died in the High score group (3.9%), 2 deaths were due to cardiovascular causes (2.6%, P=0.497). No cardiovascular deaths occurred in the Low syntax score group. In the High score group, 1 patient suffered from ischemic bowel (1.3%, P=1.000), and 3 from new onset congestive heart failure (3.9%, p=0.246) but none were reported from the Low syntax score group. There were no cases of limb ischemia in either group. 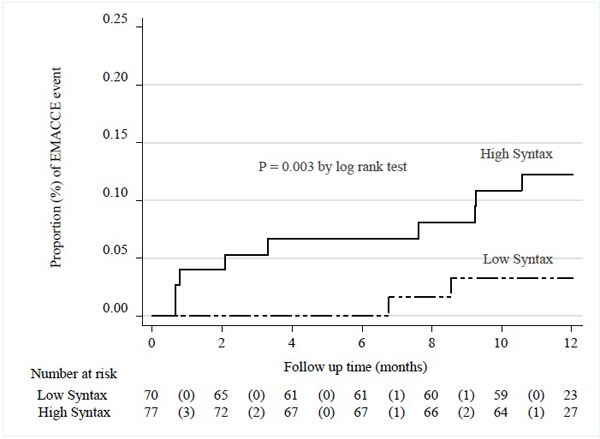 Clinical outcome of patients with high and low syntax score groups (1 year follow up). Kaplan-Meier curves showing cumulative incidence of EMACCE events between Low syntax group and High Syntax group. (Numbers in parenthesis indicate number of EMACCE composite event). As shown in Table 3, parallel and significant up-regulation of Elastin and Collagen I was observed in the High syntax group relative to Low syntax group. However, Collagen III was significantly down regulated in the High syntax score group. (Full results in Supplementary Material 2). According to IHC fluoroscore analysis, significantly higher concentrations of Collagen I and Elastin were observed in the High Syntax score group (Table 4). This data correlates with proteomic MS results, confirming that there was Collagen I and Elastin up-regulation in High Syntax score group by both methods. Comparisons level of expression of different biomarkers by High and Low Syntax Score Groups. Since the conception of Syntax score was validated, many studies have shown that morphological complexity of coronary artery lesion is related to post-operative cardiovascular major adverse events. A higher syntax score associated with higher post procedural MACCE (Sum of repeat revascularization, myocardial infarction, cerebrovascular events and cardiovascular death) [3, 4]. Well documented but striking relation between complexity of coronary tree lesions and cardiovascular complications across arterial system not very well understood. To enlighten the possible histological characteristic of arterial walls in High Syntax score group making them more vulnerable, we compared Low and High syntax score groups undergoing coronary artery bypass grafting. We evaluate association between syntax score as indicator of atherosclerosis severity and histological changes in the ascending aorta representing systemic changes in arterial walls. Coronary artery bypass patients were chosen because they allow us to obtain aortic wall tissue during procedure without alteration of clinical practice and additional risk to the patients. We intentionally excluded patients with Intermediate Syntax score to avoid grey zone and underline potential difference between Low and High Syntax groups. To recruit patients with Low Syntax score we faced expected challenges. In our study, the patients with Low syntax score underwent CABG rather than PCI due to various reasons, but are mainly due to unsuccessful PCI procedure or unsuitable coronary anatomy for PCI. To capture all possible post-operative cardiovascular complications, we included peripheral vascular disease, episodes of gut ischemia, new onset of congestive heart failure and defined it as extended MACCE (EMACCE). We excluded all valve-related and non-cardiac causes of congestive heart failure from this study. The one year follow up demonstrates that a High Syntax score group is associated with significantly higher risk of EMACCE. This prove that Syntax score as an indicator of atherosclerosis severity is strong predictor of secondary complications likely related to plaque progression or rupture, even if the culprit lesions have been stented or bypassed. Moreover, we found that the MI rate in High syntax score patients was significantly elevated despite higher number of bypass grafts performed for these patients (four vs. three (p<0.001)). It may seem that with the multiple bypasses of stenotic vessels in CABG, it is less likely MI, to occur post operatively. However number of MACCE and especially MI, it is not necessarily related to number of bypasses and their quality. In the study by Gregg W Stone, half of the post-procedural MACCE were actually due to non-culprit lesions . To seek the biochemical basis of the difference in clinical outcome between High and Low syntax groups, we looked at aortic wall extracellular matrix by two independent methods: proteomic and IHC analysis. The ascending aorta was chosen as it is an example of an elastic artery and was readily available for investigation in coronary artery bypass patients. Our primary interest was proteomic as a first step to understand ECM content in ascending aortic wall. The tissues were sent for proteomic analysis by LC-MS/MS and more than a thousand different proteins were identified. Amongst them we were able to detect arterial wall abandon extracellular matrix proteins: Collagen I, Collagen III and Elastin. The LC-MS/MS revealed that Collagen I and Elastin are significantly elevated in the aortic wall tissues in the High syntax score group in compare to Low syntax score group, but Collagen III depressed in High syntax score group. Our IHC validation confirmed that in the High syntax score group, Collagen I and Elastin are significantly up-regulated. However, even Collagen III was actually lower in the High syntax group by IHC result, this difference was not significant. Although, trend of IHC for Collagen III data from proteomic result and IHC pointed to the same direction, we did not receive significant difference which could validate decrease of Collagen III in High syntax score group. At the same time, calculated Elastin/Collagen III ratio, a surrogate of aortic wall elasticity, was significantly up-regulated in High syntax score group. This ECM changes likely reflects diffuse thickening of arterial wall. This parallel changes suggesting that systemic alteration taking place in the arterial walls affect aorta in the same degree as coronary artery stenosis appreciated on coronary angiography. This could explain our clinical result showing that High syntax score patients suffered from a higher number of cardiovascular events involving different arteries: the coronary, mesenteric, peripheral and cerebral vessels. The High syntax score patients have a high atherosclerotic burden, and likely higher level of the systemic inflammatory process known to cause production of cytokines (like TGF-beta, IL 1 and PDGF) that can lead to up-regulation of Collagen I and Elastin gene expression by smooth muscle cells (SMC) . Normally, Collagen I and III predominate in the arterial wall to maintain its stability. Collagen I, in particular, is known to stabilize plaques and protect against plaque rupture . Therefore it may seem unusual that a higher level of Collagen I is associated with EMACCE. However, Collagen I itself is also a critical up-regulator of SMC proliferation and contributes significantly to the growth of plaques. It also enhances the recruitment and accumulation of monocytes into the vessel wall . It is also shown in study by Gregg W Stone et al. that most non-culprit lesions that were responsible for unanticipated MACCE were not just thin cap fibro atheroma, some were characterized by a large plaque burden . Published data and our results emphasized that in the High syntax score group, Collagen I may not just reflect high atherosclerotic burden, it might also consider as prognostic marker for furthering plaque progression thereby increasing the patients’ risk of cardiovascular events. Similarly to Collagen I, Elastin plays a structural role in the media of arterial vessels and is expressed more during plaque development. It immature fibers may be an atherogenic stimulus via recruitment of pro inflammatory cells . Like Collagen I, the high total Elastin content in the High syntax score group may not only reflect the high atherosclerotic burden of patients within this group, but also predispose to plaque progression. In contrast to Collagen I and Elastin elevation in High syntax score, our proteomic MS results showed that Collagen III was lowered in the High Syntax Score group, however, the difference was not confirm by IHC. The regulation of Collagen III reported to be important for pathogenesis of arterial occlusion, plaque rupture healing, and thrombus organization . The inflammatory process involved in atherosclerosis might decrease Collagen III and thereby weakens plaque caps, making the plaque susceptible to rupture [17-19]. Although the cause of the observed selective decrease in Collagen III is still not known, this also could be related to shorter turnover time of Collagen III, making its levels more volatile compare to relatively stable Collagen I . Patient with Low and High Syntax score behave differently and required different approach in the clinical practice. Large cohort study proved that patient with high score do better with coronary artery bypass surgery. Coronary artery bypass surgery provide drop in mortality, decrease number of repeated coronary intervention [2, 3]. The answer is clear: more severe the coronary atherosclerosis is, than more cardiac intervention patient will required on coronary artery unless grafts use to bypass diseased parts of coronary tree. Although, clinical message is clear, the pathophysiological explanation might be not straightforward. Assumption that histologically coronary artery in low and high syntax score different, could explain difference in the procedural result. In reality, obtain syntax score follow by histological evaluation of coronary artery might be not possible, vascular biopsy of arterial wall as a surrogate of histological evaluation of coronary artery is available during bypass surgery. Our study of ascending aorta biopsy from aortic punch, revealed significant elevation of Collagen I and Elastin level in High score group. However, clinical application of Collagen I, Elastin and Elastin/Collagen III ratio difference obtained by MS proteomic and confirmed by IHC technique, need to be established, some important assumption could be made from this study. First, if coronary artery in High syntax score group behave similar to ascending aorta and produce or accumulate more Elastin and Collagen in the aortic wall, it might explain the less satisfactory result with stenting in this group of patients. In contrary, for coronary artery bypass patients, new vessels used for coronary artery bypass surgery eliminate this problem and replaced diseased segment of coronary artery supporting long term result. Second, this result opens up the possibility that aortic punch obtain during coronary artery bypass surgery could be used as a potential source of clinical biomarker. Our data support that Collagen I and Elastin/Collagen III ration could be consider as biomarkers correlated with severity of coronary atherosclerosis. If successfully proven on large cohort of randomized patients, this data on the quantified ECM components could allow stratified patients accordingly and guide further therapeutic options and the frequency of follow ups. Identification of potential patients who may require more intense surveillance and additional therapy (long term dual antiplatelet therapy as an example), might prevent or decrease number of cardiovascular events. However, the aortic tissue biopsy required for analysis is not readily available except patients going for CABG. Therefore, the application of this knowledge might depend on advances in imaging technology that can quantify ECM proteins in vivo. Existing studies showed that Elastin is a promising imaging biomarker for molecular MRI and may provide us with a noninvasive technology to assess severity of atherosclerosis . If extend to the different type of Collagens present in aortic walls, assessment of ECM contents can be usefully applied in clinical practice and expand beyond patients with coronary artery bypass surgery. Our data from single center shows that High syntax score patients after coronary artery bypass surgery has higher chance to suffer from secondary major cardiovascular and cerebrovascular events Proteomic data confirmed by IHC result revealed that the aortic tissues in patients in High and Low syntax score groups are different histopathologically. Ascending aorta of patients with High syntax score have elevated level of Collagen I, Elastin content. These data identify aortic punch tissue as potential source of biomarker related to atherosclerosis severity and clinical outcome. Histological changes in the extracellular matrix production amongst high syntax score patients might be possible explanation of difference in the procedural result between coronary artery bypass surgery and percutaneous coronary intervention. We thank all the patients, surgeons and nurses who participated in this study; Professor Dominique de Kleijn, Laboratory of Experimental Cardiology, University Medical Center Utrecht, Utrecht, the Netherlands, for his scientific comments and reviews. de Kleijn DP, Moll FL, Hellings WE, et al. Local atherosclerotic plaques are a source of prognostic biomarkers for adverse cardiovascular events. Arterioscler Thromb Vasc Biol 2010; 30(3): 612-9. Peeters W, de Kleijn DP, Vink A, et al. Adipocyte fatty acid binding protein in atherosclerotic plaques is associated with local vulnerability and is predictive for the occurrence of adverse cardiovascular events. Eur Heart J 2011; 32(14): 1758-68. Peeters W, Moll FL, Vink A, et al. Collagenase matrix metalloproteinase-8 expressed in atherosclerotic carotid plaques is associated with systemic cardiovascular outcome. Eur Heart J 2011; 32(18): 2314-25. Ionita MG, Catanzariti LM, Bots ML, et al. High myeloid-related protein: 8/14 levels are related to an increased risk of cardiovascular events after carotid endarterectomy. Stroke 2010; 41(9): 2010-5. Kong CH, Lin XY, Woo CC, et al. Characteristics of aortic wall extracellular matrix in patients with acute myocardial infarction: tissue microarray detection of collagen I, collagen III and elastin levels. Interact Cardiovasc Thorac Surg 2013; 16(1): 11-5. Barlow WE, Prentice RL. Residuals for relative risk regression. Biometrika 1988; 75(1): 65-74. Fisher LD, Lin DY. Time-dependent covariates in the Cox proportional-hazards regression model. Annu Rev Public Health 1999; 20: 145-57. Stone GW, Maehara A, Lansky AJ, et al. PROSPECT Investigators. A prospective natural-history study of coronary atherosclerosis. N Engl J Med 2011; 364(3): 226-35. Amento EP, Ehsani N, Palmer H, Libby P. Cytokines and growth factors positively and negatively regulate interstitial collagen gene expression in human vascular smooth muscle cells. Arterioscler Thromb 1991; 11(5): 1223-30. Ponticos M, Smith BD. Extracellular matrix synthesis in vascular disease: hypertension, and atherosclerosis. J Biomed Res 2014; 28(1): 25-39. Adiguzel E, Ahmad PJ, Franco C, Bendeck MP. Collagens in the progression and complications of atherosclerosis. Vasc Med 2009; 14(1): 73-89. Makowski MR, Wiethoff AJ, Blume U, et al. Assessment of atherosclerotic plaque burden with an elastin-specific magnetic resonance contrast agent. Nat Med 2011; 17(3): 383-8. Fuster V, Moreno PR, Fayad ZA, Corti R, Badimon JJ. Atherothrombosis and high-risk plaque: part I: evolving concepts. J Am Coll Cardiol 2005; 46(6): 937-54. Blasi C. The autoimmune origin of atherosclerosis. Atherosclerosis 2008; 201(1): 17-32. Quillard T, Tesmenitsky Y, Croce K, et al. Selective inhibition of matrix metalloproteinase-13 increases collagen content of established mouse atherosclerosis. Arterioscler Thromb Vasc Biol 2011; 31(11): 2464-72. Narula J, Nakano M, Virmani R, et al. Histopathologic characteristics of atherosclerotic coronary disease and implications of the findings for the invasive and noninvasive detection of vulnerable plaques. J Am Coll Cardiol 2013; 61(10): 1041-51.